Kevin Cozner, husband to Captain Ray Holt, was the man everyone wanted to see in the debut season of FOX’s Brooklyn Nine-Nine. Who could love the stolid, unflappable Captain? 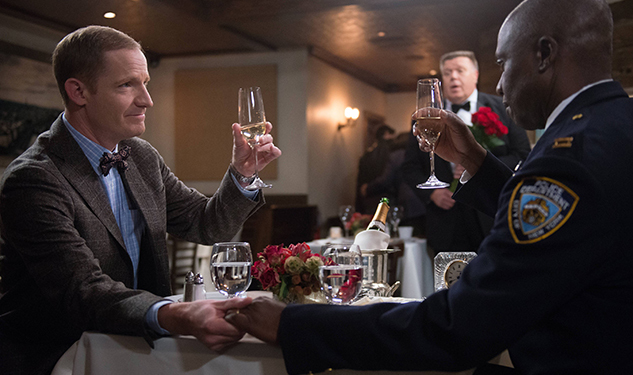 When actor and comedian Marc Evan Jackson was finally revealed in “The Party” episode to be the man sharing his life with Andre Braugher, it was worth the wait. Over the course of a hilarious evening at Kevin and Ray’s apartment, Detective Jake Peralta (Andy Samberg) and his misfit colleagues attempt to impress their boss’ husband, a classics professor at Columbia University, who turns out to have a chip on his shoulder when it comes to cops. The dynamic may be jovial, but it was important to both Jackson and Braugher that their relationship was never the joke. “They are a couple of people that love each other that are in a long-lasting relationship,” Jackson says. The series' spark comes from the top: Both Brooklyn Nine-Nine and NBC’s Parks and Recreation are produced by the same team, which is led by producer Michael Schur. “The casts are like the Seal Team Six of comedy,” Jackson says of working on both shows. In addition to his small role on the cop series, which he recently reprised in a brief appearance during episode 5 of the current season, Jackson has also appeared on several episodes of Parks and Rec. When he’s not populating the fictional worlds of those two hit shows, Jackson is one of the many actors — including Busy Philipps and Nathan Fillion — who perform in a staged production of an old-time radio broadcast, The Thrilling Adventure Hour. During New York Comic Con, the group announced that after 10 years of stage performances, the last would be take place April 11, 2015, with the show continuing in podcast form. “It’ll be a gang-busters 10th anniversary show,” Jackson promises. But for now, we can hope for more Kevin Cozner, since his relationship with Capt. Holt on Brooklyn Nine-Nine is something we haven't seen enough of TV. A mature gay couple mining comedy gold.